The new images were taken Dec. 10 in the low-altitude mapping orbit (LAMO), from an altitude of only 385 kilometres (240 miles), and have a resolution of 35 metres (120 feet) per pixel. Dawn will remain at this altitude for the rest of its mission. Ceres can now be photographed with the most detail yet seen, including, of course, the famous white spots, which researchers now think are most likely salt deposits left on the surface after water or ice evaporated. In one of the new views is a crater chain called Gerber Catena, just west of the large crater Urvara. Such crater chains are common on rocky planets and moons which are still covered in many craters. 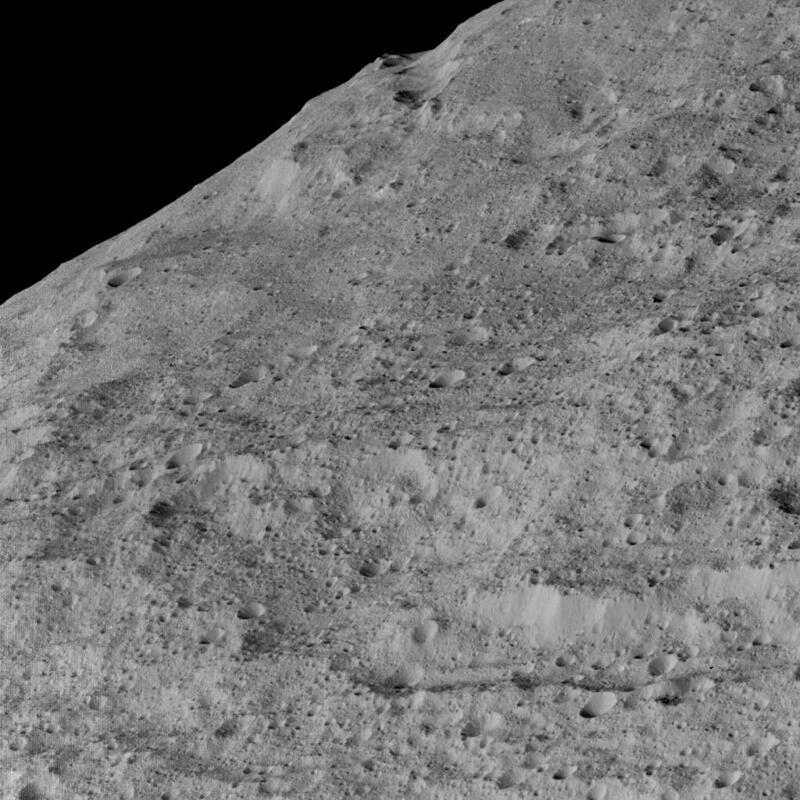 Ceres also has large troughs, which are also common. They are caused by contraction, impact stresses, and the loading of the crust by large mountains. 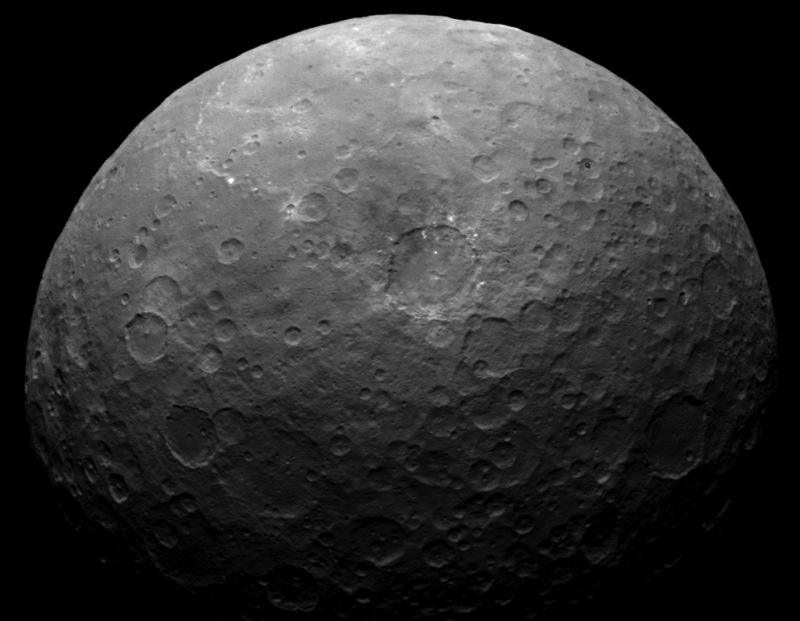 Fracturing has occurred on Ceres as well, despite its small size, only 940 kilometres (584 miles) in diameter on average. 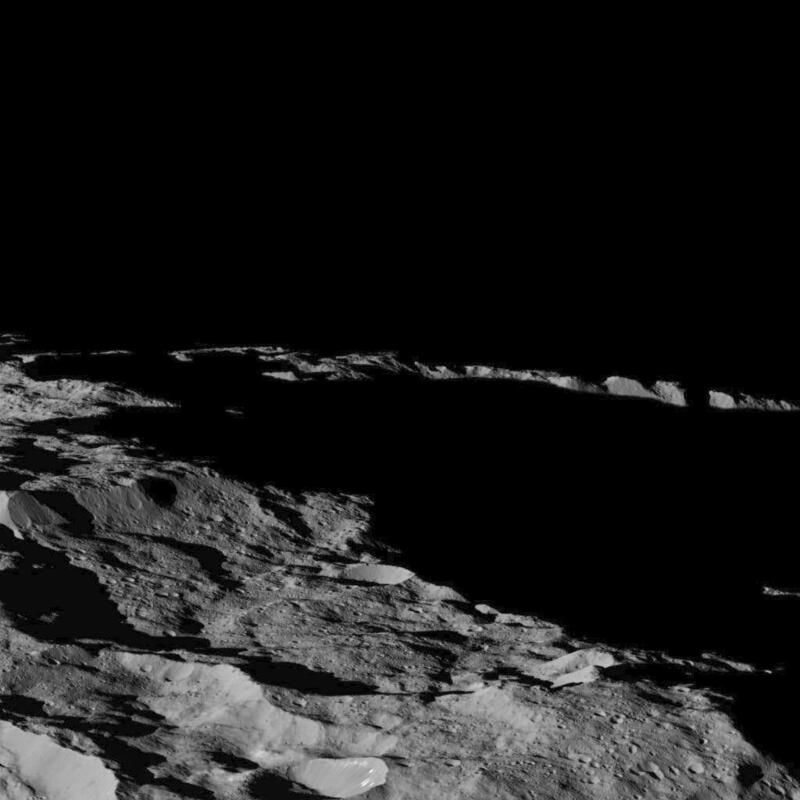 Some of Ceres’ troughs may even be tectonic in origin, according to researchers. Ceres has surprised scientists so far, with its odd spots and apparent ammoniated clays on its surface. Measurements of the brightest spots in Occator crater suggest the presence of a type of magnesium sulfate called hexahydrite. Evaporation of water or ice seems to be involved, but whether the spots formed after impacts or perhaps hydrothermal activity isn’t clear yet. Haze has been observed inside Occator crater, but only around noon time on Ceres, not at dawn or dusk. It is theorized that the process may be similar to what happens on comets, when water vapour lifts tiny particles of dust and ice off the surface. 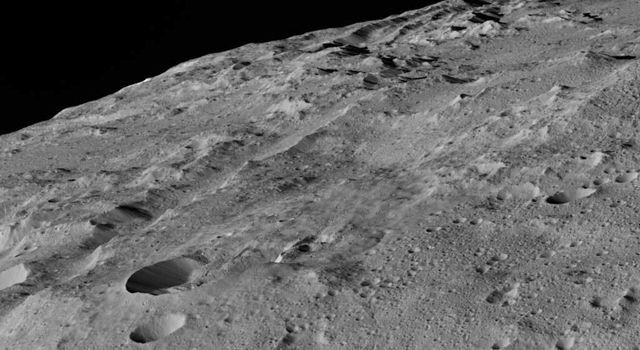 As reported previously, two new studies now suggest that the bright spots are salt deposits, not ice, as had been previously theorized, and that there are ammonia-rich clays on Ceres – another unexpected finding. 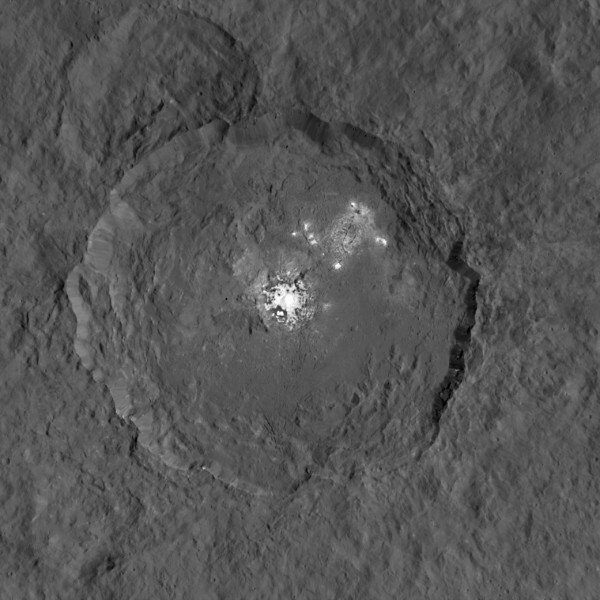 The spots also suggest that Ceres has a subsurface layer of briny ice. Another intriguing feature is the isolated conical mountain called “The Lonely Mountain,” which is about 6 kilometres (4 miles) tall. 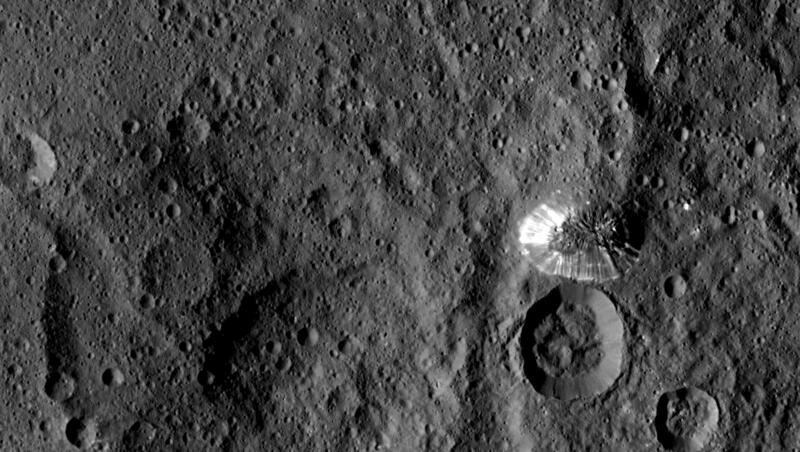 How it got there is still a mystery for planetary scientists, but it is additional evidence for active geology on Ceres, at least in the past. With nothing else like it nearby, it stands out like a sore thumb in the surrounding terrain.